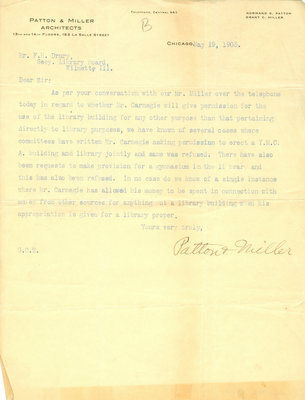 As per your conversation with our Mr. Miller over the telephone today in regard to whether Mr. Carnegie will give permission for the use of the library building for any other purpose than that pertaining directly to library purposes, we have known of several cases where committees have written Mr. Carnegie asking permission to erect a Y.M.C.A. building and a library jointly and same was refused. There have also been requests to make provision for a gymnasium in the library and this has also been refused. In no case do we know of a single instance where Mr. Carnegie has allowed his money to be spent in connection with money from other sources for anything but a library building when his appropriation is given for a library proper.